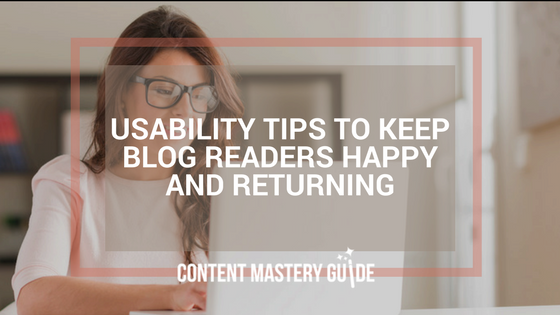 If your blog isn’t easy to use, people won’t stay very long and they probably won’t return. Usability is the key to making sure readers find what they need. In a previous post, Tema Frank from Frank Reactions introduced us to usability, and now we’ll get her concrete usability tips to use when blogging for business. From a usability standpoint, is it better to have a blog be part of your main website or on a separate platform at a separate address? Why? From a marketing perspective, I think it is better for a blog to be part of your main website. It is so hard to get readers to your website that you don’t want to be splitting your efforts. The more traffic you can drive to one site, and the more valuable content you have on it, the higher it will rank in search results. It is also better for usability if you keep your blog and website in one place. Otherwise people may get confused going back and forth between the two. What are some tests bloggers can use to improve the usability of their blog and website? To start with, use Google Analytics and track what is most popular with your readers over time. If you see that your bounce rate is high (people coming to your site and leaving right away), you can assume that you’ve got a problem. After you enable this feature, open a file that you want to check, and check the spelling. When Word finishes checking the spelling and grammar, it displays information about the reading level of the document. Do you have any other usability tips for business bloggers? Be focused. Try to write on one consistent topic. If you wander all over the place, people won’t know what to expect, and are less likely to follow you. Think about who you are writing for, and what will be relevant and of interest to them. Blog regularly. Aim to post at least once or twice a week if you want to build a following. Promote your posts. Use social media and other tools to promote what you’ve written. I love the WiseStamp tool that you drew to my attention, Linda. It lets you have a link to your latest post automatically placed in your email signature. Minimize jargon. You may be tempted to throw a lot of jargon in to show that you are an industry “insider” but usually even tech types find it easier to read jargon-free documents. Don’t have patterned backgrounds! Fortunately, this is not nearly as common as it used to be. Be human. This can be really tough in a business blog, but people will respond better if they get a sense of the real person writing rather than just a corporate face. Try to bring some personal elements into your writing. So while you’re aiming for high-quality content that will be interesting and useful to your ideal clients, be sure to think about how easy it is to find and navigate through the information on your blog. The more usable your blog, the more likely people will stay on your site long enough to learn more about your business.